Another design in the series of new sport shirts from Devol, this one is a black cotton shirt with a star design. The shirt comes in jacket layer, and in shirt layer with underpants layer to tuck into pants, but they can’t be low-rise pants, I’ll warn you, or the little open bit at the bottom will show your belly. Not a good look, guys, believe me. If the shirt is hanging out, it’s another story, because it’s conceivable the wind could have blown that shirt open a bit at the bottom. The shirt comes with flexi collar and cuffs, easily adjusted, and a tie that hangs loosely around the neck. The Casuale pants are from the new Spring collection at Stellar. A comfortable, not too fancy pair of khakis, in a good shade, these pants include a pants layer and an underpants layer. They come in a number of shades and patterns, including the beige shown here. 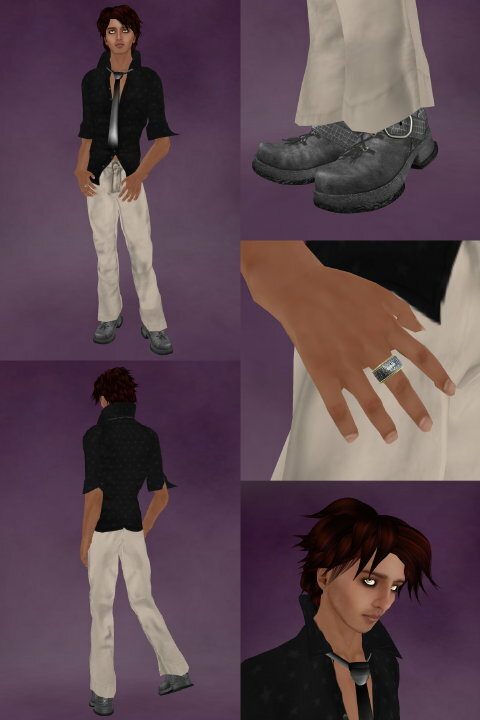 Finishing off the outfit, I chose one of the partner rings from Mhaijik Guillaume, the very cool Xing boots from Shiny Things, and Exile’s Dylan hair in black cherry. Hi Kaori! You’re welcome…it’s a great shirt! And thanks. Thanks, Ben. I’m beginning to appreciate the hand-drawn look more and more. Also, the more I look at other skins, the more I appreciate the Ocean skin. I love my Xing boots. I have several colors and use them all the time. They were recommended here several months ago, and I have worn them often! My partner and I have those rings. They are beautiful close up. I saw them after you recommended their steampunk ring awhile ago.